Class-A's California League (Single-A) named Doug "God" Harvey to its 2017 Hall of Fame class, alongside former Major Leaguers Dave Duncan, Mike Piazza, Kirby Puckett, and manager Tony La Russa. Harvey's induction into the California League's Hall of Fame follows a 2010 induction into the National Baseball Hall of Fame for his service as a Major League umpire. Harold Douglas Harvey's HOF plaque in Cooperstown describes him as a "commanding arbiter whose unique combination of integrity, heart and common sense earned universal praise." 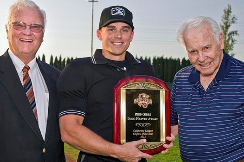 The California League is the only league in Minor League Baseball to honor its umpires, which it does with the "Doug Harvey Award" for top Cal League umpire, bestowed annually since 2010. Cal President Charlie Blaney, Gibbs & Harvey. 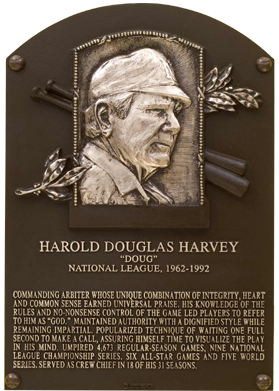 Harold Douglas Harvey's Hall of Fame plaque. Harvey served in the National League for 30 years and 4,673 games from his 1962 NL debut until his retirement following the 1992 season. He worked the California League from 1958 through 1960, and the Pacific Coast League in 1961. Born in South Gate, California, on March 13, 1930, Harvey began as a local basketball referee, officiating college basketball and football while also working minor league baseball, joining the NL staff in 1962 and experiencing the first-ever regular season game at Dodger Stadium on April 10, 1962. Harvey was the last umpire hired to the big leagues not to have attended umpire school. Harvey appeared in seven All-Star Games (1963, 64, 71, 77, 82, 87, 92) and his postseason career featured nine National League Championship Series (1970, 72, 76, 80, 83, 84, 86, 89, 91), and five World Series (1968, 74, 81, 84, 88); he was the plate umpire when Kirk Gibson hit the famous walk-off home run during Game 1 of the 1988 World Series. Harvey also appeared during the rules-centric "You Make the Call" segment that occasionally aired on Mel Allen's "This Week in Baseball" program before the original program's retirement in 1998. His sleeve #8 is presently worn in the Major Leagues by crew chief Jeff Kellogg.